Garden image from the Tomb of Rehkmire, Eighteenth DynastyLast month I visited the Oregon Museum of Science and Industry to see their stunning exhibit, The Discovery of King Tut. King Tutankhamen reigned in the New Kingdom, specifically the 18th Dynasty, a period known for its splendor. One of the most magnificent, but also overlooked elements of 18th Dynasty, were their sacred gardens. The earliest recorded gardens were seen in Egypt in about 3,000 BC. Many Egyptian gardens were considered sacred and designs were based on religious beliefs which determined the layout and plant species chosen. Egyptian gardens consisted of terraces, lakes, canals and even menageries. In royal gardens, such as those created by King Akhenaten at Amarna and King Thutmose III at Karnak, ibex, antelopes, turtle doves and the royal animal, the lion, were kept. The effort and skill it took to create beauty in a terrain that consisted of desert and a flooding Nile river were remarkable. Gardeners of the time dealt with unique challenges, such as removing sand blown in from the desert. Because rainfall was unpredictable, water was collected and conserved in lakes and pools. These bodies of water were not only a place to rest and refresh but also a place where rituals were performed. Architects who created these beautiful gardens, like Ineni and Senenmut, who advised Queen Hatshepsut were celebrated and appreciated by their royal superiors. The common mandrake, Mandragora officinalum L., pictured here, was prized by the ancient Egyptians as an aphrodisiac. 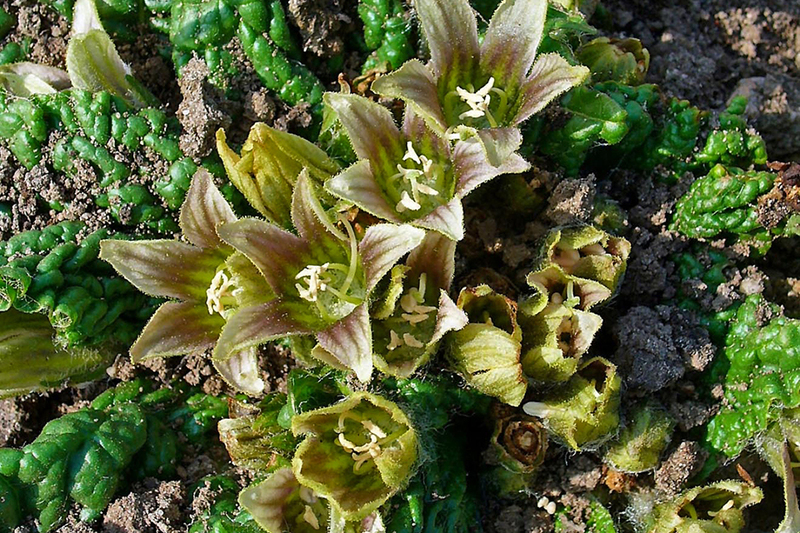 Photo by H. Zell (CC BY-SA 3.0) via WikipediaSome of the most important and frequently illustrated plantings in the New Kingdom are mandrake, poppy, cornflower, water lily and papyrus. The fruit of the Mandrake, Mandragora officinalum L., smells sweet, induces sleep and was prized for its believed aphrodisiac properties. The poppy flower was used in wreaths and its seed and oil in cooking. The cornflower was used in garlands and embalming, and was believed to be a remedy for scorpion stings. Papyrus sedge, Cyperus papyrus L., was used for a variety of purposes such as boat making, food and writing materials. Water lilies, which are referred to in many books as lotuses were presented as offerings to the dead and in temples. No expense was too great for the Pharaonic garden and plants were often imported from far away places. 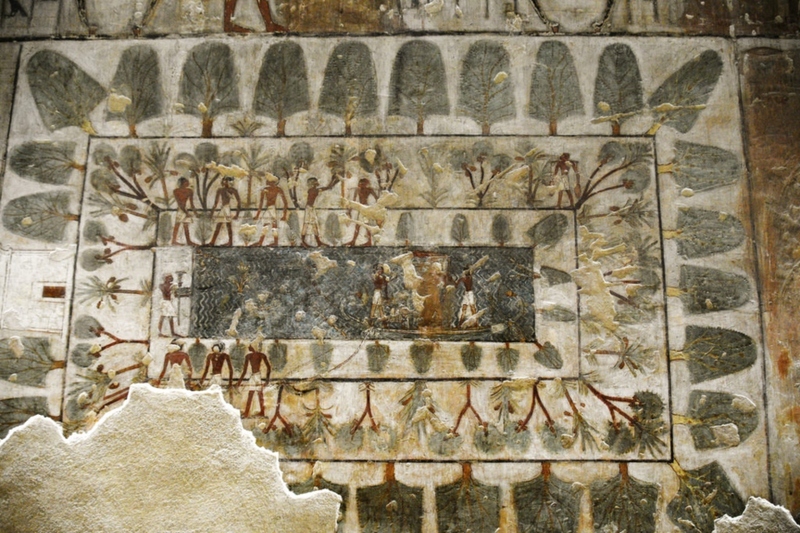 Queen Hatshepsut and her successor Tuthmosis III had incense trees of myrrh and frankincense brought in for their gardens. Sacred trees like the sycamore, date palm and pomegranate were grown. Vegetables most commonly planted were onions, lettuce, garlic, cucumber, watermelon, chickpea and lentil. Barley was a staple crop, used for making bread and beer. Hemp, Cannabis sativa L., was used for making rope and flax, Linum usitatissiumum L., with its beautiful blue flowers were used to make linen. Although we can’t visit the ancient Egyptian gardens, through text and illustration we get a glimpse of their grandeur. Greeks, Romans and many other societies around the world admire the gardening talents of the ancient Egyptians.